During the British colonial occupation, the British, in 1896, developed it as a hill station because of its cool alpine climate, especially during the hot season. The colonial government of Myanmar would move to May Myo during the hot season to escape from the high heat and humidity of Pyin Oo Lwin. 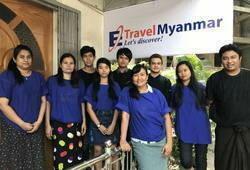 The name May Myo means May Town in Burmese, and comes from the town's first administrator, Colonel May. As a legacy of the colonial period, the town has approximately 10,000 Indian and 5,000 Nepali inhabitants, who served in the British Indian Army and settled in May Myo after the British left, and granting independence to Burma. May Myo was also an important educational centre during colonial times, with the Government English High Schools, such as St. Mary's, St. Michael's, St. Albert's, and Colgate, all based in the town. It is also home to the Myanmar Defence Services Academy (DSA). Pyin Oo Lwin is also well known for its colonial style houses with large compound and pine trees, unique horse carriages in town. Pyin Oo Lwin is also a good place for shopping. Knitted sweaters, wines, Strawberry jams and various fresh fruits are popular products of Pyin Oo Lwin. Organic ground coffee from local plantations is good enough for export, as well. Purcell Tower stands in the heart of the town, Pyin Oo Lwin. The clock was one of the few made in 1934 by Gillete and Johnson Co. of England in commemoration of the Silver Jubilee of the reign of King George V of Britain. Pyin Oo Lwin market is situated at the center of the town, near Purcell Tower. There have a lot of products from the fields, especially wines, strawberry jam and coffee. Various kinds of woolen clothes; very famous product of Pyin Oo Lwin, are available at the market. There are many British colonial houses and Christian churches in Pyin Oo Lwin. Most of the colonial houses are situated at the south end of the circular road. Candacraig Hotel, originally a guest house of The Bombay Burma Trading Company, was built in 1904. Nan Myaing Hotel, former the colonial rest house called Craddock Court. Gandamar Myaing Hotel, formerly known as 'Croxton' is one of the old British mansions converted into hotel. The original Governor's House was built in 1903 and completely destroyed in about 1943. The impressive replica of the colonial Governor's House can be viewd as a high class hotel at that place. All Saints Anglican Church, founded in 1912, is one of the historical churches in Pyin Oo Lwin.